Remember in my primark haul when I bought these brocade (or jacquard, whatevs.) 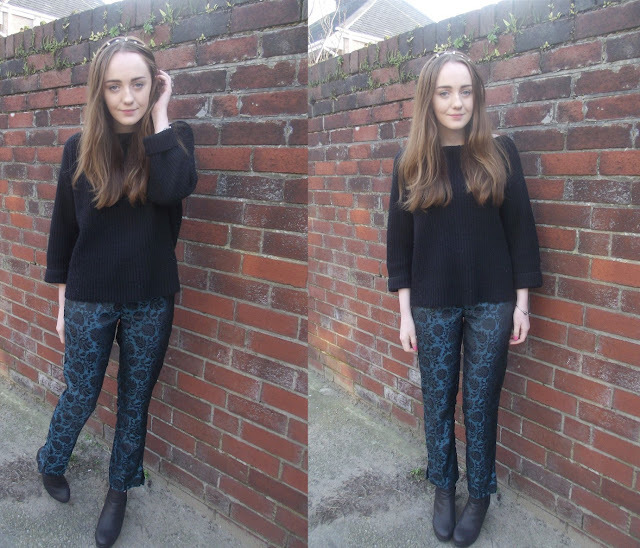 trousers for just £3? A lot of you were excited to see how I'd style them and as they're quite a tough cookie to style more than one way, I thought this would be a good opportunity to write my first '3 ways to wear' post. 1. The first outing these got was on a night out to a friends' birthday; I fancied a change to a short dress and heels so teamed these with my new black shirt, which is just the right side of oversized, and added some colour with my turquoise heels and matching clutch. 2. Soon after, after much deliberating over what to wear to a fashion students' applicant day (talk about stress) I threw these attention-grabbers on with a comfy jumper and awesome studded headband. 3. As soon as the sun puts his hat on, I'm out there in the albeit, slightly cold, outdoors sporting my sheer white shirt, headscarf and fancy trousers. Is it just me or do I look about 14 here? Great post! 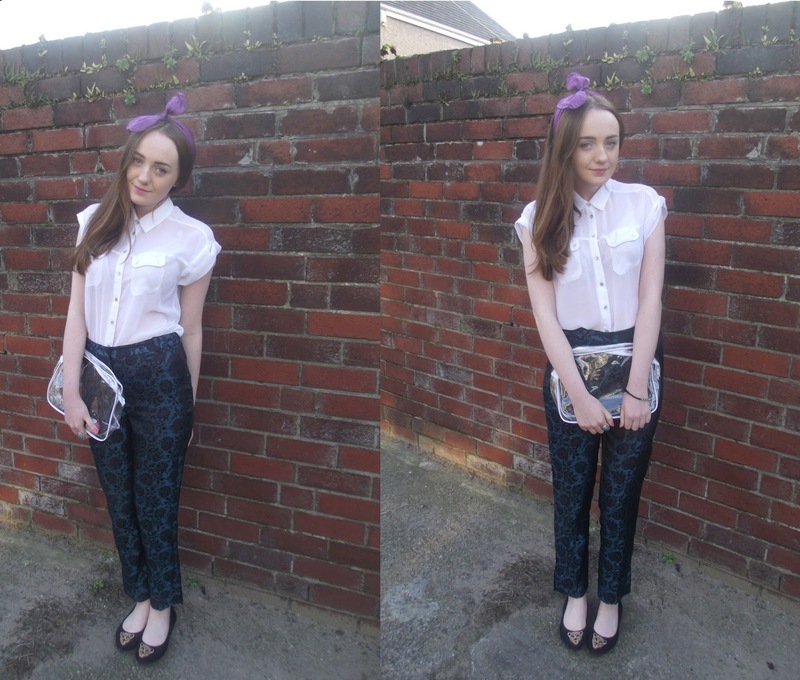 I love all 3 outfits, I think the 2nd one is my favourite as I love dressing down more formal pieces (your trousers) you seriously look great and I cannot believe you got them for £3! Oh God I love those trousers! Amazing heels in the first look too! i was going to buy these trousers and chickened out, majorly regretting my decision after seeing how cool they look here! love the first look especially. Such great outfit combinations! You look great in all of them! The first outfit is my favourite, you look so cute! You are so pretty !! I love your brocart jean ! This pics are so great, I absolutely love your style! Gorgeous trousers! Love the first outfit with the turquoise accents.